The UT Center for Advanced Medical Simulation, established in early 2007, is a state of the art 6500 square foot simulation center offering medical teams at the UT Graduate School of Medicine (UTGSM), UT Medical Center (UTMC), and healthcare professionals across the region opportunities to master medical skills using life-size human patient simulators, laparoscopic and endoscopic simulators, and other skills-building models. Medical simulation is the imitation of real-life experience including the use of task and virtual reality trainers, as well as standardized patients to refine technical and clinical skills of healthcare professionals. Medical simulation immerses the learners into an artificial but lifelike medical environment where skills can be learned and practiced with immediate feedback from peer and/or faculty observers or computerized performance metrics integrated into some simulators. Simulation can replicate almost any diagnostic or therapeutic situation, from simple IV insertions using low-fidelity task technology to complicated surgeries using high-fidelity, computerized manikins or virtual reality modules. At the UT Center for Advanced Medical Simulation, physicians, students, and other members of the healthcare team attain not only improvement in individual skills, but also learn and practice team skills that are essential for patient safety. This type of multi-faceted, orchestrated training improves critical thinking, decision making, and clinical techniques - all without imparting risk to a real patient. The UT Center for Advanced Medical Simulation is the only facility in Tennessee and one of just 68 in the world to earn accreditation as a Level I Comprehensive Accredited Education Institute (AEI) from the American College of Surgeons (ACS). The Level I designation is the top accreditation available. The AEI accreditation program is a voluntary peer-review process. Receiving accreditation involves submitting an extensive application that reflects compliance with stringent standards. Following acceptance of the application by the AEI, a site visit by experts must validate the application. The Accreditation Review Committee then reviews the application and either approves or denies accreditation. Institutions that successfully complete the process are approved for a period of three years before reaccreditation is required. The AEI Consortium accredited its first institutes in 2006 and was established by the American College of Surgeons' Division of Education. 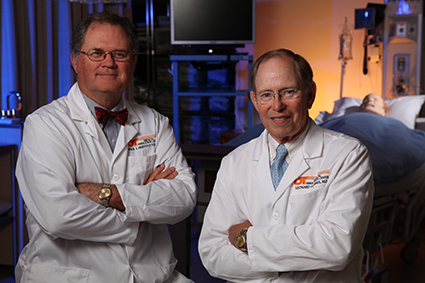 Paul Huffstutter, MD (pictured left) and Leonard Hines, MD (right) are Co-Directors of the UT Center for Advanced Medical Simulation. Both Huffstutter and Hines are longtime vascular and general surgeons and are assistant professors at the UTGSM and believe both new and experienced clinicians, regardless of healthcare system affiliation, can train and advance their skills at the center. "With accreditation comes the opportunity and encouragement to collaborate with other institutes on research efforts," said Dr. Hines. "This will expand our initiatives directed toward continually improving the quality of medical education and patient safety." Dr. Huffstutter states, "achieving accreditation is more than a reflection of the continued emphasis on excellence in education and technological advances at the UTGSM and UTMC. It also encourages the availability of simulation activities to all members of the healthcare team in the entire region. In promoting safer and higher quality healthcare, the center is a valuable asset to the medical community and the many patients served." The mission of the UT Center of Advanced Medical Simulation is to add a new dimension to the training of physicians, residents, medical students, and clinical staff of the University of Tennessee Graduate School of Medicine (UTGSM) and the University of Tennessee Medical Center (UTMC) as well as to improve the quality of care in our community by making state-of-the-art simulated training available to physicians and other healthcare providers across the region. 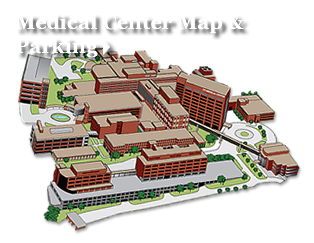 The center's primary goal is to continual improvement in quality of patient care and safety through education, practice, and assessment. Why is Medical Simulation Important? It is estimated by 2015, simulation will comprise 1/3 of time spent in medical education. Simulation presents a risk-free environment where the welfare of patients is not at stake and allows learners to be immersed in the challenges of patient care under the supervision of expert physicians. The use of human patient simulators allow imitation of the sophistication and complexity of the human body and foster learning in this risk-free environment. With the use of virtual reality, complex procedures are simulated. Performance metrics and feedback are provided to the learners, which results in measurable improvement in skills.